By Elson T. Elizaga. Published Feb. 23, 2018. Also in Mindanao Gold Star Daily. 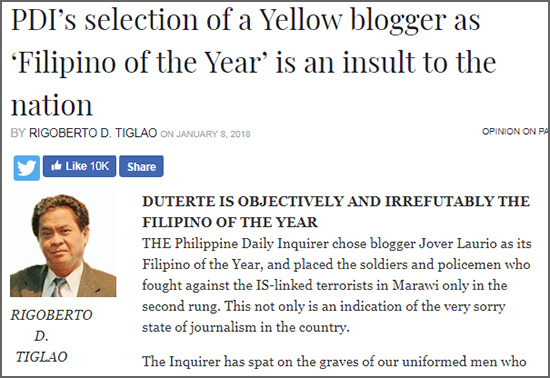 Manila Times columnist and Duterte propagandist Rigoberto Tiglao complained on Jan. 8 that the Philippine Daily Inquirer should not have given blogger Jover Laurio the Filipino-of-the-Year award because the recognition is "an insult to the nation". He wrote the military (and the president) deserve the award because they risked their lives during the Marawi siege. If we follow Tiglao’s reasoning, then every newspaper and organization should give the Filipinos-of-the-Year award to soldiers every year, without exception. So, forget everyone else. Forget the writers, the doctors, the people who campaign for peace, the farmers, the victims of sexual assault, and the whistle-blowers. They can never be Persons of the Year because they don't carry firearms and fight wars. Perhaps the police can qualify for risking their lives in executing thousands of people, but other professionals like nurses, OFWs and teachers can never be. We learned last week that the alumni association of the University of Santo Tomas gave Mocha Uson an award for "exemplary government service". Mocha is a shameless fake-news guru.1 If she deserves such an award, despite her incompetence as assistant secretary for social media at the Presidential Communications for Operations Office (PCOO), one might as well give a similar recognition to the Bureau of Fire Protection of Davao. Tiglao has not given any comment on this award. So, Tenedero was saying that Uson didn't accomplish anything exceptional for the government. And yet, they gave her an award -- to encourage her to become a good public servant, because she is not. Uson returned the award, probably sensing it’s more of an insult than a compliment, but the best service she can give to the Filipino people is to resign immediately and return the P133,000 she had been receiving every month from taxpayers. The second best she can do is go to Naga and Bicol2 and assist in the delivery of services to the victims of the eruption of Mayon Volcano. 1 Excerpt from the Wikipedia article on Mocha Uson (accessed Feb. 23, 2018): "Uson has been widely criticized for propagating fake news and has been called by netizens 'the Queen of Fake News'. Uson's Facebook post on that called for prayers for Filipino soldiers, but which netizens pointed out accompanied a photo of praying Honduran forces. In her defense, Uson contended that she never claimed that the photo was that of members of the Philippine Army, and that the photo was just a "symbolism". Sharing the photo of a dead girl who was supposedly raped and murdered by Filipino drug addicts and asking why there was no outrage from the Commission on Human Rights. It turned out that the incident was from Brazil in 2014. Uson later took down her post. Attacking the administration and students of St. Scholastica's College for forcing the young students to attend anti-Ferdinand Marcos burial rallies. This turned out to be false as attendance by the students at the rallies were purely voluntary and done with the permission of their parents." 2 Uson identified the location of the erupting Mayon Volcano initially as Naga. The volcano is in Albay province, part of Bicol Region. If you are using ad-blocking apps, consider whitelisting elson.elizaga.net.